Colombia's air force has bombed a suspected arms factory operated by the left-wing Farc guerrilla group, killing four rebels, the government says. 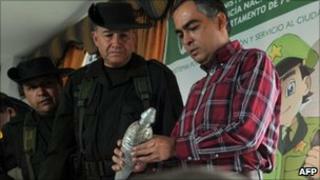 Two women were captured during the assault in Arauca near the border with Venezuela, the defence minister said. Rodrigo Rivera said there were unconfirmed reports the Farc leader in the area was one of those killed. Mines, 300 mortars and more than a tonne of explosives were also recovered, he said. The aerial assault took place on Saturday evening in Colombia's Arauca department. In a news conference, Mr Rivera said the authorities had been working to identify the bodies of the dead. He said they could include a rebel leader, Luis Eduardo Lopez Mendez, alias Efren Arboleda. "At the moment they are talking about Efren, who is the main boss of the Farc in the whole region," said Mr Rivera, who stressed that the dead man's identity could not be confirmed. Colombian President Juan Manuel Santos praised the operation. "I congratulate the armed forces for a new hit against the Farc in Arauca," he posted on his Twitter account. In a separate development, a local councillor and a mayoral candidate in south-west Colombia have been freed, six days after being kidnapped by suspected Farc guerrillas. Dagoberto Ojeda and Ferney Satizabal were being examined by doctors, according to the acting governor of the department of Narino, Fabio Trujillo.